Story blurb: It’s amateur night at the ultra-private, members-only Caloosa Club on the Fort Myers, Florida, riverfront. Trouble begins when the fat lady sings. Her triumph is sweet. But, only hours later, the diva lies near death in a hotel room upstairs, the victim of a vicious beating. Hotel manager Dan Ewing and his sidekick, Lee County Detective Bud Wright, soon discover that this was no lady and that a variety of unsavory characters hoped to dance on the dead diva’s grave. In Southwest Florida in January 1951, almost anyone who wanted to have a little illicit fun put his—or her—life on the line. About the author: Elliott Mackle served four years in the United States Air Force during the Vietnam era. As a very green second lieutenant he commanded a squadron of cooks and bakers, later achieving the rank of captain. He was stationed in California, Italy and Libya, the latter the setting for his new novel, CAPTAIN HARDING’S SIX-DAY WAR (Lethe Press). His previous novel, HOT OFF THE PRESSES (Lethe Press), is based in part on his adventures covering the 1996 Olympic Games for the Atlanta Journal-Constitution. Then an AJC staff writer, he served as the newspaper’s dining critic for a decade, also reporting on military affairs, travel and the national restaurant scene. His first novel, IT TAKES TWO, was a finalist for a Lambda Literary Award. He has written for Travel & Leisure, Food & Wine, the Los Angeles Times, Florida Historical Quarterly, Atlanta and Charleston magazines and was a longtime columnist at Creative Loafing, the southeast’s leading alternative newsweekly. Mackle wrote and produced segments for Nathalie Dupree’s popular television series, New Southern Cooking, and authored a drama about gay bashing for Georgia Public Television. Along the way, he managed a horse farm, served as a child nutrition advocate for the State of Georgia, volunteered at an AIDS shelter, was founding co-chair of Emory University’s GLBT alumni association and taught critical and editorial writing at Georgia State University. He lives in Atlanta with his partner of 40 years. 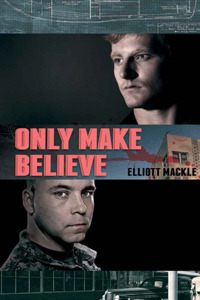 Only Make Believe by Elliot Mackle [Lethe Press, 2012] is the second in a series, but the first I have read. However, it does very well as a stand-alone novel. The story is set in post WWII, 1950s Fort Myers, FL, and is a next adventure in the lives of Dan Ewing, owner of the members-only “Caloosa Club,” and his closeted lover, Detective Bud Wright. Bud also works, part time, with the county sheriff’s office. Both are good strong characters, but it is Dan who is the stronger, mostly on account of being comfortable in his own skin. One of the areas that I thought Mackle captured very well was the schizoid thinking of the time, regarding homosexuality. Homophobia was very much to the fore, of course, but even those who were somewhat sympathetic (i.e. marginally accepting) shrunk from the scene when forced to make a choice. Moreover, the over-the-top reaction of some homophobics made a nice bit of tension while the plot was unfolding. Another aspect that I thought was both effective and clever was to show the impact of this tragedy on the victim’s 17 y.o. son. An aspect that is very often overlooked. My quibbles are minor. For example, I thought the resolution of the murder investigation was a bit incredible (but not inconceivable), and although it is not specifically directed at this novel, I am beginning to weary of the ‘persecution complex’ that seems to be dominating most GLBT stories. I do recommend Only Make Believe, however, as a well-conceived, superbly written murder mystery/romance. Four and one-half bees. Cynthia Cramer, Author of “Real Justice: Guilty of Being Weird,” has submitted a short story to the Reader’s Digest “Most Interesting Community” contest. Her submission is about her municipality of Richer. Manitoba, so let’s help recognize Richer by taking a moment to vote. To cast your vote, go to: Canada’s Most Interesting Towns Contest | Readers Digest.ca: http://www.readersdigest.ca/cmit/submission-details?submission_id=187. YEA RICHER, GO, GO. GO! Thanks for dropping by. I hope I have given you some ideas for your reading pleasure. The authors featured here, and I, welcome your views. Gerry, thanks so much for the fine review. It’s much appreciated. I know what you mean about the persecution complex being so common. I do, however, always end my novels on a hopeful note. It does get better. Happy reading. I hope that I made it clear that I wasn’t singling out your novel. It was more in the nature of a general comment. Really enjoyed your story, and especially Dan and Bud. I identified with them in some ways.